Under the stars or in a tent, on a trekking tour, camping, or on multi-day winter tours - a comfortable sleeping bag is an absolute must have. Restful sleep is particularly important for activities requiring 100% physical performance. A good quality sleeping bag will mean that you won't have to cut back on sleeping comfort just because you're not at home in your own bed! Plus you will always be refreshed and fit for the day to come. Sleeping bags differ in material, fill, pack size and weight. 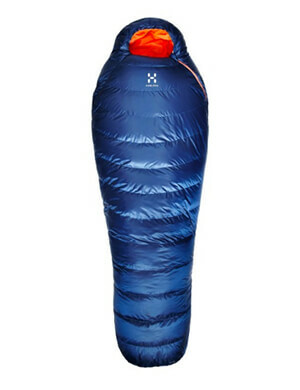 Depending on the intended purpose, sleeping bag manufacturers such as Mammut (Ajungilak), Exped or Cocoon offer numerous models ranging from ultra-light to ultra-warm. Be it a sleeping bag liner for the stay in a youth hostel or a winter version for the expedition to Greenland. Purpose of use - Every country, destination or season brings its own weather conditions. In accordance to this, obviously temperature, wind and rain need to be taken into account as well when choosing a sleeping bag. The duration and type of traveling are further important criteria. Low weight and pack size are rather more important features for long trekking tours than for camping vacations, since a sleeping bag has to be insulated much better for a winter in Norway, than for a summer camp at Lake Garda. Temperature range - The temperature range is usually indicated as comfort temperature and limit temperature. In accordance to the country of destination, season, and purpose, you have to choose the coldest expectable temperature as comfort temperature. The limit temperature only servers as emergency reserve but usually, a comfortable sleep is not possible anymore. Design- mummy, oval and rectangular shaped sleeping bags are very popular. The hoods can be laced-up which helps to generate maximum insulation and comfort. Models for cooler regions also have draft collars and covers for zippers. Some designs offer stretchable materials to increase the freedom of movement in the sleeping bag. Zippers come in a variety of patterns and are usually either on the right or on the left side. Furthermore, sleeping bags are offered in sizes, which can be perfectly adjusted to your height. Moreover, the manufacturers also offer special designs for women and children. Material - The most important decision to make when it comes to the material of sleeping bags is between down fillingand synthetic fibers. Although cotton or silk sleeping bags are available as well, their share is relatively low. Due to their excellent insulation capacity while being lightweight at the same time, downs are perfect for sleeping bags. However, those sleeping bags also require certain care. Furthermore, they should be kept as dry as possible, since downs can clump when wet and thus, lose their ability to keep warm. Such problems do not occur with synthetic sleeping bags. But generally, synthetic fiber is a little heavier and the pack size is higher. Weight - To design sleeping bags as lightweight as possible, usually goes hand in hand with the use of expensive materials and production processes. Therefore, lightweight models are also a little more expensive. For all those outdoor enthusiasts who carry their whole equipment over many days or weeks every gram counts. Pack size - Almost the same can be said about the volume of sleeping bags. It is less important for the transportation to the campsite. Yet, when it comes to long backpack tours or long-distance journeys by plane, it becomes a crucial point. Three-seasons sleeping bags can be utilized from spring to autumn. However, it is recommended to use them during normal weather conditions and on low altitude. These models may be insulated, but they are explicitly not suitable to for extreme cold temperatures. Sleeping bags for trekking and hiking should be as lightweight as possible and have a small pack size. Depending on the weather conditions, down or synthetic fiber versions can be taken into consideration. Bivy sacks are outer shells for sleeping bags, which allow sleeping under the stars. They are usually the only rescue in times of emergencies, e.g. if you cannot make it to the next mountain hut, or if you need a shelter because of a sudden downpour. In case of an accident, a bivy sack is perfect for keeping an injured person warm until rescue arrives. Travel sleeping bags or sleeping bags for backpacking comply with the season and the country you are traveling to. In order to facilitate maintenance, many travelers opt for lightweight synthetic sleeping bags. Often, there are affordable designs as well, which however, are not meant to be utilized in very low temperatures. Sleeping bags for the summer are insulated relatively less and accordingly, they are more lightweight. They are usually used in tents and during warm seasons. Since their design and material are not very demanding, they are usually cheaper as well. Winter sleeping bags and thermal sleeping bags secure survival in extreme surroundings during expeditions and even guarantee a comfortable sleep at -40°C. A lot is demanded from its quality and material. In accordance to their high quality, these top versions are heavy, bulky, and costly as well. 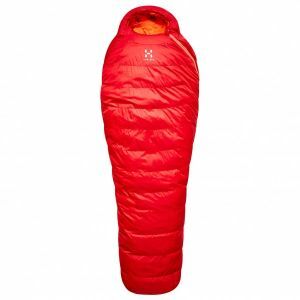 Ultra-light sleeping bags are especially popular for trekking and hiking. By optimizing the weight of sleeping bag, tent and cooking equipment you can minimize quite some load that needs to be carried on the back. However, to choose a marginal range of temperature is not advisable. The pack size and weight may be as less as possible, however, this should not leave you shivering with cold at nights. Sleeping bag liners are made of silk, cotton or synthetic fiber. They can be used during extremely hot temperatures. Other than that, they serve as liners in down or synthetic fiber sleeping bags. Wit the help of liners the thermal output of the sleeping bag increases. Sleeping bags for huts or youth hostels do not have insulating properties, since they are used in combination with the bedding that is already available there. Even though they are lightweight and offer a small pack size, they are not suitable for the usage in tents. However, they are used as sleeping bags on pilgrimages as well. Each sleeping bag has a suitable mat. A sleeping pad is essential for a sleeping bag in order to reach sufficient insulation and a high level of comfort, since some terrains can be very hard and uncomfortable. For choosing the right pad, you need to consider the same factors as for sleeping bags: temperature range, design, material, weight and pack size. Generally, there are sleeping pads made of foam, as well as self-inflating sleeping pads consisting of a foam-mixture and air chambers. Thanks to the integrated valve, they are able to inflate themselves on their own. Even the classic air mattress has a number of fans. However, due to their awkward handling they are rather used for camping. Depending on the thickness of the sleeping pad, they can be used throughout the summer and the three seasons, or even as a thermo-mat over winter.